Since I like to make a lot of thing myself instead of having generic store bought items, I often find myself studying a item intently in order to break it down for construction. 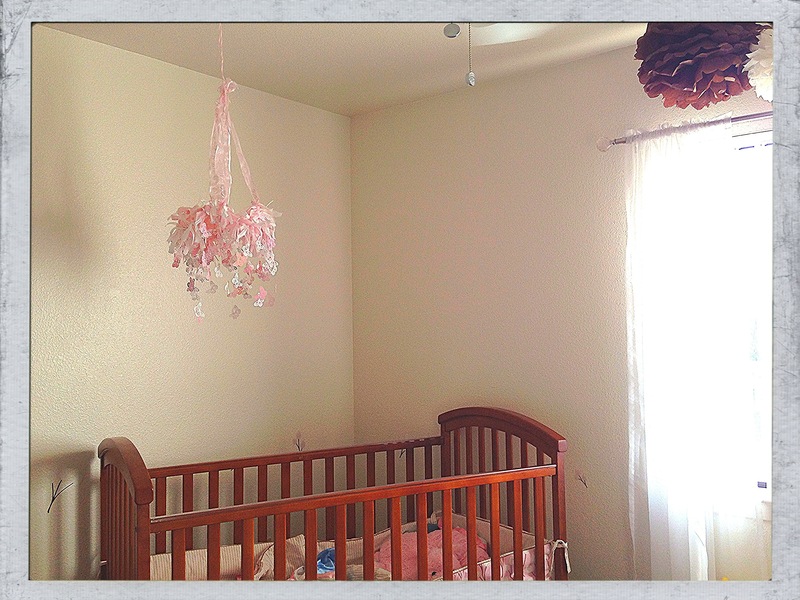 While Hubs was away and I was preggers with SB, I had complete control of decorating the nursery. I never asked for his input since baby would be almost a year before he meet her (yes, you read that right!). So I spent many of pregnant induced sleepless nights stalking Pinterest for decorating ideas. 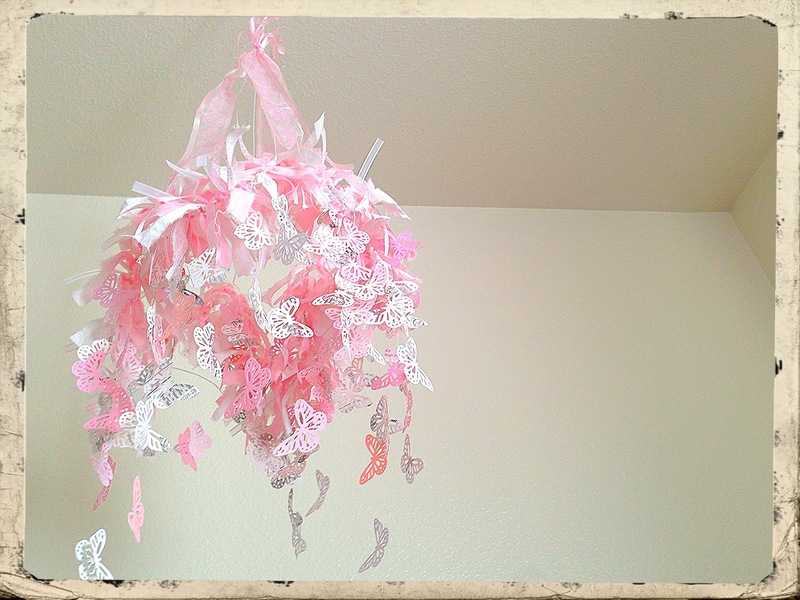 One of my favorites with this ribbon and butterfly mobile. It fit perfectly with the bedding I was reusing from Diva’s nursery. And since it was hand made and one of a kind, it was right up my alley to take on as my next project. The nursery was in browns and links so when choosing my supplies I chose in that color scheme. To make it more stable I would suggest using a wooden hoop you use for cross stitch. However, due to where we live we only have one craft store that didn’t carry them. So I went to Walmart and found the white floral wire. It works but doesn’t hold it’s shape as well. I made two circles out of the floral wire. One larger than the other. I then took 4 pieces of the floral wire and spaced them out evenly, hooking one end to the small circle and the other end to the large circle. So when you lift the small circle, the large one is connected (since I did this over a year ago; I didn’t for see to take photos). I then attached for more pieces of floral wire to the small circle. I gathered the other ends of the floral wire into a cone and taped them with white tape. I made a small loop on the end to hang them from. After that I just cut pieces of my ribbon, material, lace and yarn at about 3 inches each. And just tied a simple knot around the white floral wire. I did no pattern and tied it all extremely random. I wanted all the different materials to show, so I just tried not to group them. After that I got to punching out my butterflies from the paint chip cards. I can’t tell you how many I did. But maybe 30. I made about 7 “chains” of butterflies tied on a piece of fishing line. Since paint chip cards come with 3-4 order different shades of colors, I made sure I didn’t tie two of the same shade close together. On 7 of the chains I tied 5-7 butterflies. On about 5 chains I tied 3-5. I wanted to vary the lengths of chains. After I punch and tied all the butterflies, I then tied the 7 longer to the top smaller circle. And the 5 shorter chains I tied to the lathers bottom circle. I then took my 3 inch wide ribbon I purchased and hot glued 4 pieces along the 4 floral wires at the top I attached to hang. This hides the floral wire. I then created a cute bow and hot glued it over the hook I made to hide that as well. Lastly, I screwed in the eye hook into the ceiling and hung up the mobile using the hook I created with the floral wire. Good thing is I know when I need to lower the crib mattress bc I find pieces of butterflies on her floor. So just make sure you hang it high enough to where baby can’t reach. And it beats the $60 kit on etsy you can buy. Determine how much savings from a deposit.